As made obvious by its name, the ZTE Visible R2 is one of the first budget-class Android phones to be pre-integrated with Visible, a Verizon subsidiary that squeezes typical carrier features, such as billing and customer service, into a single mobile application. As of this write-up, the app is limited to Visible devices only, but users will soon be able to bring their own Android or iOS phones to the network. Initially priced at 99 dollars, this ZTE model is by no means a head-turner, with a measly (by the standards of this technical Phonerated review) 1.4GHz quad-core processor and a 2GB-only RAM powering its mix of pros and cons. While you're here, don't forget to pop open our list of the fastest smartphones on the market today. 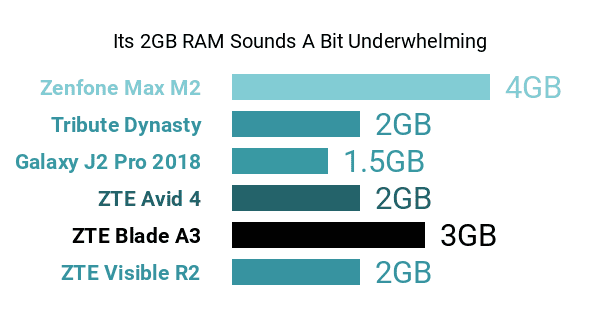 Also among its drawbacks is its 16GB internal memory , seeing that some comparable models pack twice as much native storage. That being said, its support for up to 2TB's worth of memory expansion winds up as an outright pro in our book. In comparison, most of its budget-class rivals allow only up to 256GB or 512GB of external memory. Another weak point is R2's mundane 5-megapixel-only selfie camera . That said, its single-lens 13-megapixel main camera, which offers standard HDR, Panorama, and Time-lapse capabilities, sounds just about right, considering its aforementioned hardware cons. This Visible-integrated Android rocks a 5.45-inch display that mimics some high-end phablets with its 18:9 aspect ratio , although its 1440 x 720 HD+ resolution and 295ppi pixel density score keep it within entry-level bounds. Its screen is furbished by a 2.5D-curved Corning Gorilla Glass panel. 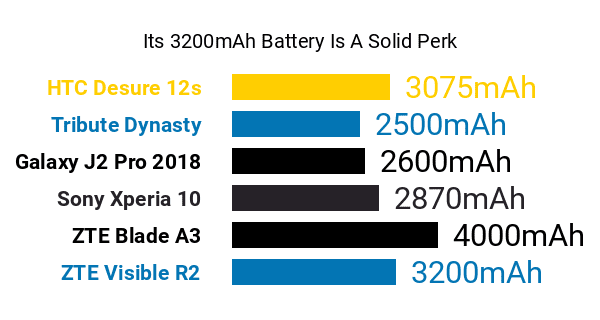 The R2's pros and cons feed off a 3200mAh battery that promises up to 24 hours of continuous talk time (1440 minutes), which was over 60 percent higher than the average value as of this specs-based analysis. Its features also include the Dolby audio technology , 4G connectivity, and a rear-mounted fingerprint scanner. Summing up, the Visible R2 caters to shoppers in search of a somewhat well-rounded budget-class Android smartphone. Best Smartphones 2019 Is it your best choice? * Prices shown are only indicative. They were recently fetched by our system and may have changed meanwhile.